Winter means you have to slow everything down and force-feed bass, right? Wrong. 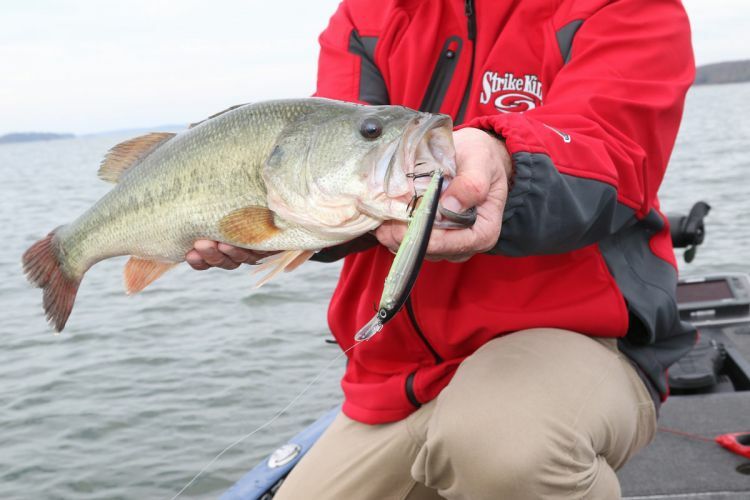 These pros tell you how to catch the fish of a lifetime when the chill is on. 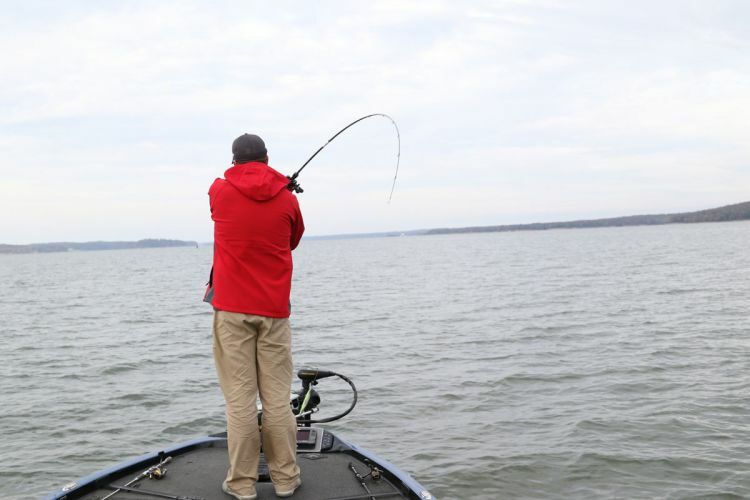 “Cold water” and “lethargic” seem generally accepted as conjoined thoughts when dealing with winter bass. However, savvy anglers know that, despite the chill, there remains real potential for some stellar bites during the early goings of a new year. Toledo Bend guide Darold Gleason agreed. He’d certainly prefer T-shirt weather, but he knows the potential that awaits within the calendar’s first page. 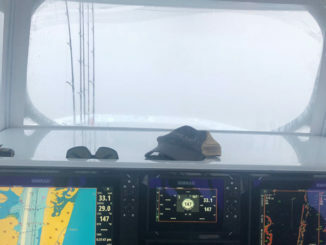 “That’s just about prime time, depending on the number of cold fronts we get and how cold the water temperature gets,” Gleason said. 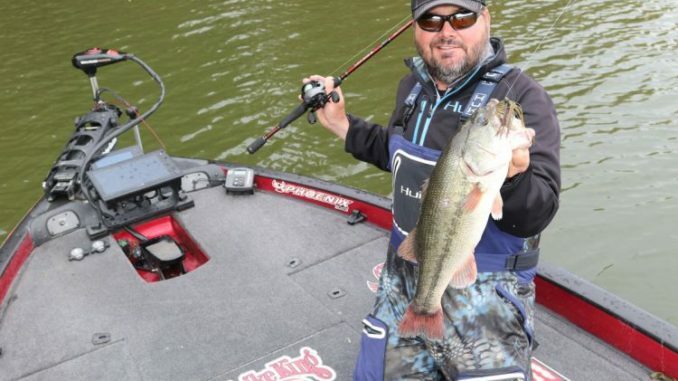 “On any of the lakes — whether it’s a cypress-tree lake, one of the rivers or even a reservoir like Toledo Bend — it’s prime time to catch large fish. Typically, we start each season by going directly to where we think the fish should be. That’s certainly not a wrong approach, but Gleason advised a work-back approach. Specifically, look at the historic spawning areas and move deeper to find drops, hard edges like points and big cypress stumps sitting in deeper water. “You can look at the way the place sets up with the spawning flats, and then work your way outward to the areas leading into those spawning flats,” Gleason said. 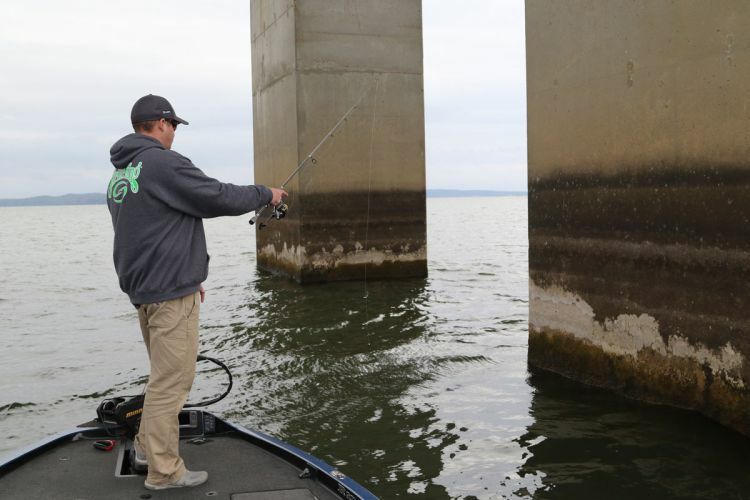 “You just have to recheck them over the course of a couple weeks until the fish move in there. Hackney pointed to ditches running into creek arms as major points of focus for prespawners. These deeper lanes, he said, are main travel routes for seasonal migrations, and early stagers will hug the safer depths before they start relating to the flats and banks. Such ditches, drains and staging areas might occur in a variety of depths, depending on your chosen lake. 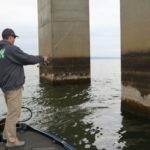 As Gleason noted, one of the reasons Toledo Bend has led the Bassmaster list of Top 100 lakes for the second consecutive year is its habitat diversity. Anglers heading to the north end can target early prespawners with relatively shallow presentations around wood, points, etc., in 4 to 6 feet of water, while those targeting the southern end can catch prespawners on grass edges, drop-offs and creek channel swings in 14 to 20 feet of water. 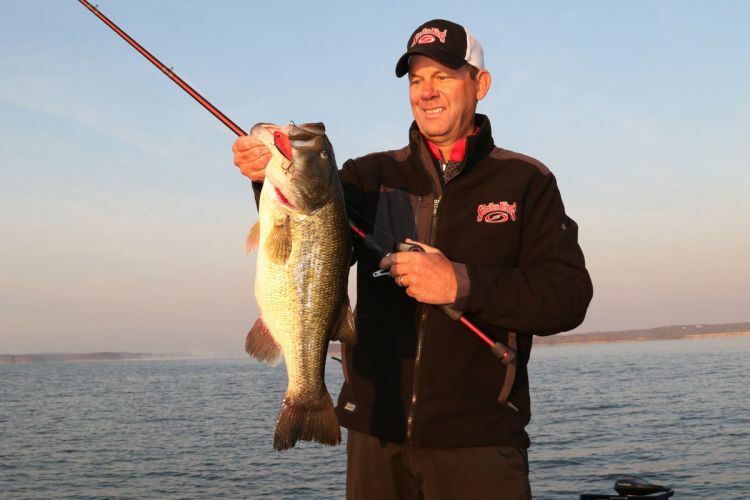 For the January-February period, Elite Seris pro Kevin VanDam likes a lipless bait like the Strike King Redeye Shad because he can employ his signature power fishing style to dissect an area and locate fish. Crawfish colors are best this time of year, so stick with those red, brown and orange patterns. Gleason adds a squarebill crankbait and a spinnerbait to this search plan — especially on cypress tree lakes. 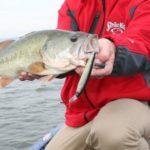 •Jerkbaits — An easy meal for any bass that’s still feeling sluggish, jerkbaits imitate cold-stunned shad that suspend in vulnerable postures with occasional fluttering. Hackney suggested a two-hook model around shallower grass because the lighter form won’t sink into the vegetation. • Swim jig — Hackney’s top choice for working outer edges of those creek ditches is a slow-rolled Strike King Pure Poison swim jig with a Rage Swimmer. He said swim jigs do a fine job of presenting a big profile that fattening fish can easily catch. 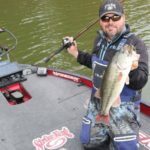 • Flipping jig — For bridge riprap, bridge pilings, stumps or flooded trees, a black/blue jig with a subtle chunk-style trailer merits a spot in your winter arsenal. 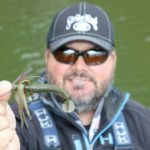 • Football jig — Rumbling across deep drops, points or anywhere prespawner take up deep positions, a ½- to ¾-ounce football jig with a craw trailer can prove too much for staging fish to resist. • Carolina rig — It’s the same application as the football jig, but with a delayed look. Gleason likes V&M Baby Swamp Hogs on the back of his C-rigs. • Umbrella rig — When big ones suspend off the bottom of deeper holes, Gleason count down the old egg beater and slow-rolls it through the schools. The fish might not be ready to move up yet, but their internal clock’s telling them to eat when food becomes available, so hang onto the rod. • Drop shots — Particularly relevant around bridge pilings, this go-to finesse rig will tempt stubborn bass. But if you’re only into the drop-and-shake thing, you’re not maximizing this versatile rig. Preferring a Strike King Half Shell or Dream Shot, FLW Tour pro Cody Meyer varies his presentations by simply changing his weight. He starts with a ¼-ounce tungsten tear-drop weight, makes a long cast along a piling and lets his rig reach bottom, where he works it along the face of the structure. Next, he switches to a 1/8-ounce weight for another long cast down the piling’s face. This time, however, he’ll let the lighter rig pendulum back to the boat in an effort to tempt suspended fish. Meyer’s last cast is the cleanup: He’ll up size to a 3/8- or ½-ounce weight and make targeted pitches to each corner of a piling, as well as a few to the middle. One rig plus multiple presentations equals angling efficiency. 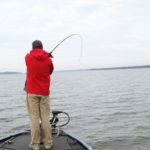 Cold fronts can stall — if not reverse — some of the prespawn movement, but the front side of a weather change can actually ignite the bite. 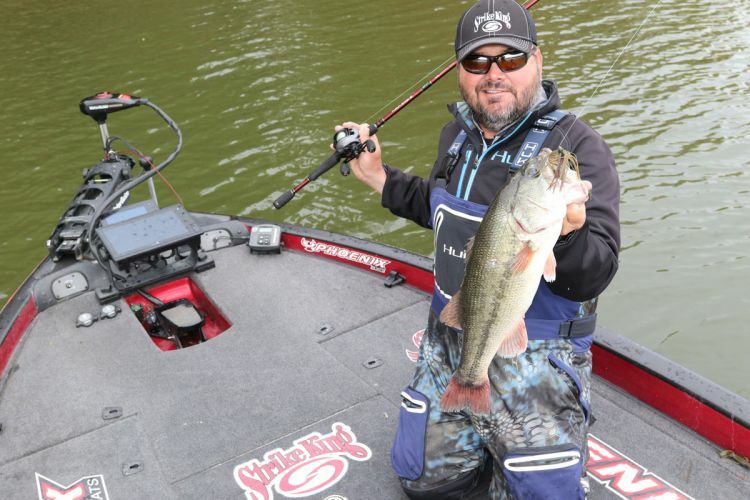 At such times, Gleason focuses on shallower prespawn areas — the ones out of the wind. Gleason said his cold-front strategy might fly in the face of common beliefs, but he sticks with what produces. For him, that means reaction baits. 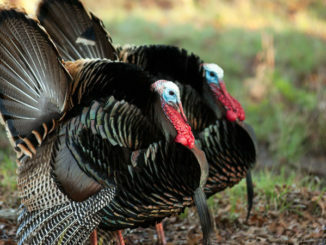 “A lot of times, it seems like they’re not eating, but they’re in positions where you can make them eat,” Gleason said. “That’s where lipless crankbaits, spinnerbaits, jerkbaits and square-bill crankbaits can get them to bite, even if they’re not eating. And speaking of reactions, Gleason warned against overlooking the psychological element. With or without a cold front, January can present some challenging conditions that’ll distract the ill-prepared angler. So layer well, invest in sturdy foul weather gear and hit the lake ready to grind through those long periods of boredom that often precede the firecracker moments. Granted, winter may not be the easiest season for bass anglers, but just like rays of sunlight piercing those old dark, dreary clouds, pockets of opportunity — significant opportunity — justify the effort. As Gleason noted, the right mind-set goes a long way. “Most days you’re not fishing for 100 bites, but you could catch the biggest fish of your life in January,” he said. “The fish have fed up all through fall and winter, so they’re nice and fat. Some of the females already have eggs, so this is when the fish weigh the most.